EXPANDED AND UPDATED Deliver Products in Short Cycles with Rapid Adaptation to Change, Fast Time-to-Market, and Continuous Improvement -- Which Supports Innovation and Drives Competitive Advantage Shifting customer needs are common in today's marketplace. Businesses must be adaptive and responsive to change while delivering an exceptional customer experience to be competitive. There are a variety of frameworks supporting the development of products and services, and most approaches fall into one of two broad categories: traditional or agile. Traditional practices such as waterfall engage sequential development, while agile involves iterative and incremental deliverables. Organizations are increasingly embracing agile to manage projects, and best meet their business needs of rapid response to change, fast delivery speed, and more. With clear and easy to follow step-by-step instructions, Agile Scrum helps you: - Implement and use the most popular agile framework -- Scrum - Deliver products in short cycles with rapid adaptation to change, fast time-to-market, and continuous improvement - Support innovation and drive competitive advantage Agile Scrum is for those interested or involved in innovation, project management, product development, software development or technology management. It's for those who have not yet used Scrum. It's also for people already using Scrum, in roles such as Product Owners, Scrum Masters, Development Team members (business analysts, solution and system architects, designers, developers, testers, etc. ), customers, end users, agile coaches, executives, managers, and other stakeholders. For those already using Scrum, this guide can serve as a reference on practices for consideration and potential adaptation. Reactions to Agile Scrum have been incredibly positive. "A superbly written and presented guide to team-based project management that is applicable across a broad range of businesses from consumer products to high-tech." - IndieBRAG "Recommended." - The US Review of Books "The book is excellent." - Readers' Favorite "An all-inclusive instruction guide that is impressively 'user-friendly' in tone, content, clarity, organization, and presentation." 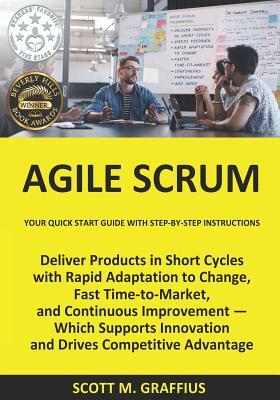 - Midwest Book Review "A-type personalities (those inclined to avoid instruction manuals) and non-readers will rejoice upon discovering this guide which makes getting started with Agile Scrum a breeze." - Literary Classics Book Reviews "A must-have for a project manager wanting to introduce Scrum to the organization." - PM World Journal "A clear and authoritative roadmap for successful implementation." - BookViral Agile Scrum has received 17 FIRST PLACE WINS in national and international competitions: 5th Annual Beverly Hills International Book Awards - Business-General category 5th Annual Beverly Hills International Book Awards -Technology category 2016 London Book Festival - Business category Fall 2016 Pinnacle Book Achievement Awards - Business category 2017 Feathered Quill Book Awards - Informational (Business) category 2016 New Apple Book Awards - Technology category 2017 Independent Press Award - Technology category 11th Annual National Indie Excellence Awards - Technology category 2017 Pacific Rim Book Festival - Business category 2017 Bookvana Awards - Green/Conscious Business category 2017 Book Excellence Awards - Technology category 14th Annual Best Book Awards - Business Reference category 2017 New York City Big Book Awards - Technology category 2017 Royal Dragonfly Book Awards - Science & Technology category 2017 Human Relations Indie Book Awards - Workplace category 2018 Florida Book Festival - Business category 2018 Pacific Book Awards - Business category Agile Scrum -- get your copy today. Scott M. Graffius is a technology leader, project management expert, consultant, international speaker, and author. He is an authority on transforming organizations' ideas and strategic objectives into reality through world-class project, program, portfolio, and PMO management inclusive of agile, traditional, and hybrid frameworks. Scott is the Founder and CEO of Exceptional PPM and PMO Solutions(TM) (http: //exceptional-pmo.com), an Inc. Verified Business (https: //www.inc.com/profile/exceptional-solutions), which helps organizations achieve their strategic objectives and boost their business results through exceptional project management. The consultancy leverages its expertise, industry standards and best practices to deliver significant results. Examples include strategically aligned initiatives, faster time-to-market, improved on-budget delivery, higher satisfaction, and greater competitive advantage. Scott worked with a client in a division of a global entertainment business on their successful journey for improved responsiveness to changing business needs, faster delivery speed, higher satisfaction, and continuous improvement-which made them even more competitive and fueled their growth. That fantastic agile transformation experience was the inspiration for Scott's book, Agile Scrum: Your Quick Start Guide with Step-by-Step Instructions. The publication has won several first place awards. The digital media kit (https: //AgileScrumGuide.com) details the awards and more. He is a former vice president of a provider of diverse consumer products and services over the Internet including social networking and internet access. Before that, Scott worked in organizations with businesses ranging from advanced technology products and services to business services, retail, e-commerce, manufacturing, and entertainment. He has experience with consumer, business, reseller, government, and international customer markets. For more information on Scott, please visit http: //bit.ly/SG-BIO.